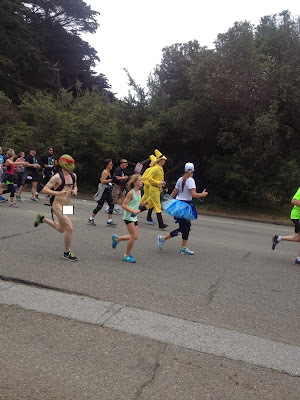 The most striking thing to me about a race like Bay to Breakers is the huge flow of humanity cascading from start to finish. I'm afraid the iPhone camera I carried during the race really couldn't capture the immense mass of nearly 30,000 people celebrating the event in their own way over the 12 kilometers. 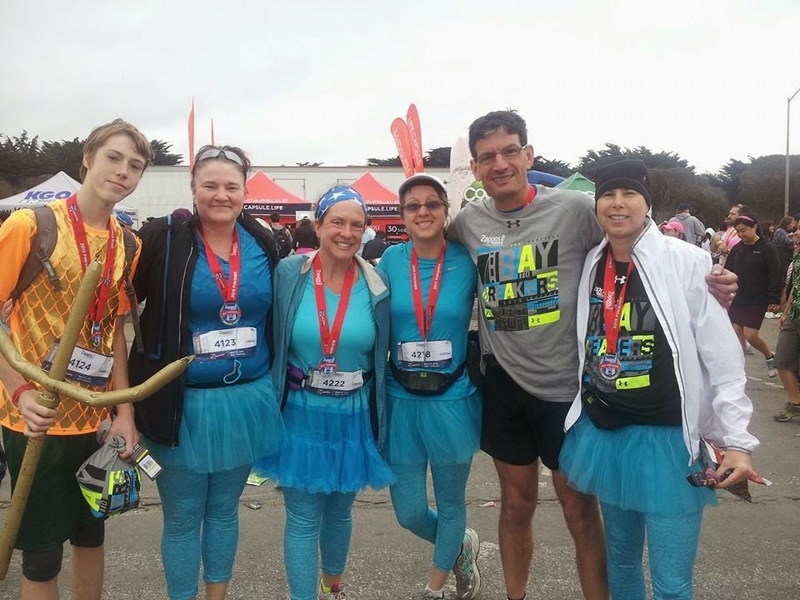 It's a race the city of San Francisco has embraced, that probably couldn't exist anywhere else in this country. These photos don't give the Bay to Breakers experience justice, but hope you will enjoy them all the same. One of them has been slightly altered for reasons that should be obvious. It's big news for South San Francisco Bay beer aficionados that Santa Clara Valley Brewing (SCVB) recently completed their brewery in South San Jose and has even started brewing a few batches. 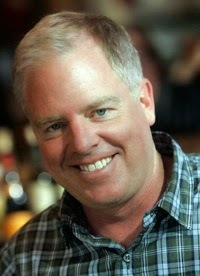 I got a chance to check the place out for myself and spent few minutes chatting with Brewmaster Steve Donohue. As you might expect, Steve doesn't have a heck of a lot of time to chat with anyone while he's getting the brewery up and running. Steve tells me to expect a couple new brews from SCVB, a Pale Ale, and a Session IPA. For those expecting the Session IPA to be a dialed down version of their popular flagship Electric Tower IPA, Steve enthusiastically assured me the Session IPA would have its own unique character unlike Electric Tower. The tap room in the front is still under construction and could likely open in as soon as a couple weeks, but the actual date will depend on when the necessary permit approvals and completed. As for getting the whole place up and running, Steve shook his head as he told me "I'm still trying to wrap my head around it, but it's been fun so far." I'll leave you with some pictures of the brewery. The tap room was still under construction so I won't post pictures of it, but when finished, I think it's going to look pretty sharp. Time once more to delve into some new brews, this time the theme is beers brewed with only one or two different hops. Let's start with Hermitage Brewing's 07270 Single Hop IPA. The beers in the Hermitage single hop IPA series are great way to learn a lot about all the different hops and their flavor characteristics. But truth be told, after trying a lot of them, I'm left thinking "Hmmm....that's interesting" instead of "I'll have another". While each beer in the series showcases each unique hop flavor profile, it also proves that brewers are wise to use blends of hops, rather than a single hop, to generate more complex and well rounded flavors. The beers in Hermitage Single Hop IPAs certainly taste good, but often seem to be lack a certain something, coming across as tasting unbalanced or incomplete, and ultimately seem like well executed brewing experimenst. That's absolutely not the case with Hermitage's 07270 Single Hop IPA, as the 07270 hop really works well on its own here. The strong tropical mango flavors that really pop with an earthy, resiny finish. It's every bit as good as Hermitage's Citra IPA, the only single hop IPA that's made it into their year round line-up. And what's 07270 hop anyway? It's a recently bred hop variety from Hopsteiner, a hop supplier from the Pacific Northwest, which apparently hasn't given it a more evocative, hop appropriate name like "Calypso" or "Galaxy" yet. A name like "07270" sounds like a piece of computer equipment but whatever they want to call it, I just hope Hermitage decides to brew this year 'round. Speaking of single hop IPAs, there's Sierra Nevada's Harvest Single Hop IPA - Idaho 7. Apparently they grow more in Idaho besides potatoes, since as you might have guessed, the hop in this brew is from Idaho. It's another hop that works pretty well all by itself. There is a noticeable progression of taste with each sip, as the initial bright grapefruit flavors give way to a fruity apricot character that eventually subsides to a resiny finish. Another great exploration into the seemingly endless hop flavor frontier, but I'm left with the nagging feeling if just seemed if a little extra depth from some other hop was brought into this beer, it would really sing. And finally, there's Gorden Biesrch Zwickel Pils, an unfiltered Pilsner made with not one but two hops, Hallertau and Tettnang. Man, did those two hops work well together. Beers like this are a reminder that amazing things can be accomplished by "just" using top ingredients coupled technically sound brewing techniques. This beer is just classic, with a robust clear malt with the slightest bit of sweetness driven with sharp, crisp grassy and slight spicy hops. Makes most other lager style beers seem mediocre and demonstrates a lot of great hop flavors can be achieved at just 30 ibu. The Session IPA has become all the rage in just a couple short years. One of first beers that helped create this wave was 21st Amendment's "Bitter American", a hoppy brew with only 4.4% abv, which quickly became popular when it was released in 2011. 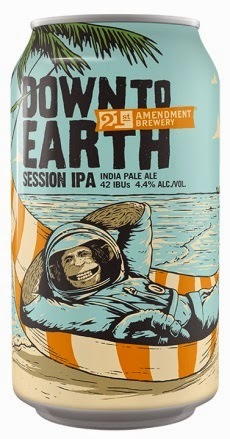 Now, 21st Amendment has released "Down to Earth" with much fanfare just a couple weeks ago. I caught up with 21st Amendment's Brewmaster Shaun O'Sullivan to ask a few questions about "Down to Earth" and also talk about the new 21st Amendment Brewery near completion in San Leandro. Here's what he had to say. Does “Down to Earth” replaces "Bitter American" in your line-up? Yes it does. We first brewed Bitter American at our small San Francisco brewpub in 2006 and then canned and distributed it in Spring 2011. At the time it was labeled as a “session ale” but it was always an easy drinking IPA. Back then the style “session IPA” was not part of the craft-brewing world. When we were designing the Bitter American package we were thinking "Who is the bitterest American?" and after lots of discussion and beers we decided it was Ham the space chimp who was the first American in space back in 1961 as part of the early US space program. Here was a chimpanzee that was plucked from the wilds of Africa and trained to push buttons, strapped to a rocket and hurled into space. Not fun for little Ham and the imagery seemed appropriate for Bitter American with Ham floating in space above the Earth. After a number of years we decided to go back and look at the package and make a couple of adjustments, one being labeling the beer exactly what it is, a “session IPA.” Once we went down that path we thought it would be fun to play with the package design and continue the story of Ham. The new name turned into “Down to Earth” and we brought Ham back home from space to a sunny beach, relaxed and stretched out in his hammock made from his space capsule’s parachute. Down to Earth is, as its predecessor, 4.4% ABV and easy drinking. Did you modify the Bitter American recipe or start over from scratch? Can you describe the development process? The recipe changed but not by much. In "Bitter American" as with "Down to Earth" we use Golden Promise pale malt from Simpson’s Malting out of the UK. Golden Promise gives this lighter beer a supportive malt backbone. Golden Promise malt is used in English session beers to maintain body and still keep the beer lower in alcohol, which can be a challenge as you’re brewing with less malt when there’s the possibility for a thin watery beer. This pale malt provides body, without a lot of sweetness, which I prefer as it avoids the competition between malt and hop flavor and bitterness in your mouth. For “Down to Earth” I left the upfront bittering hops the same and changed the late or flavor hops as well as the dry hops. Craft beer drinker’s tastes have evolved and so have mine. I saw "Down to Earth" as an opportunity to mix it up and look into newer hop varieties. In “Down to Earth” I added a lot more late kettle additions with Cascade and Mosaic hops giving the beer a more chewy citrus flavor and then dry hopped it with Centennial and Mosaic hops adding pine, citrus, mango and tropical aromas. Mosaic is a relatively new hop and Centennial is an older craft beer workhorse hop. The combination is great with the marriage of new style and old school hops. How’s the new brewery going? What’s exiting about opening our new brewery in San Leandro is that we have the opportunity to really stretch our creative wings and put out more beers and in interesting packages. We are installing a 100 barrel German brewhouse, manufactured in Hudson, Wisconsin. Both my business partner Nico Freccia and I have always had the dream of bringing the beer home to the Bay Area. We’ve been brewing with our partner brewery in Cold Springs, MN since 2008 and that’s been great for us and we’ll continue to brew with them. With the new new brewery we’ll be able to make new beers and delve into different package sizes as well as variety packs. Our San Leandro brewery will be a destination location with a tasting room, outdoor seating and the ability to see and enjoy the entire process from brewhouse to the state of the art canning line. In addition, it’ll allow us to open up new markets. We recently launched in Chicago and we’ll soon be distributing this Summer to Southern California. It’s a great time to be involved in craft beer.